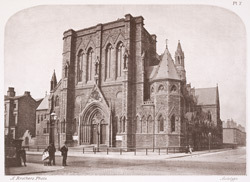 In his book James Croston informs us that the Church of the Holy Name was first set up by the Society of Jesus and that the foundation stone was laid by the Right Rev. Dr Turner, the Roman Catholic Bishop of Salford. "It is an imposing structure, in the style of Gothic architecture prevailing in the earlier part of the fourteenth century, built from the designs of Messrs. Joseph A. Hansom & Son, of London...At the western end, facing Oxford-street, is an embattled tower, at present only partially completed, but intended to be surmounted by an ornamental spire 240 feet in height. The principal entrance is on the front of the tower by double doors, enclosed within a deeply recessed and richly moulded Pointed arch, surmounted by a triangular pediment, the tympanum of which is adorned with sculptured ornaments; and there is another approach by an arched doorway on the south side. At the east end of the church is the sanctuary, in which is placed the principal altar. There are also two side chapels, each containing an altar, and both opening into the transepts."